Happy holidays everyone! I hope that all of you are well and enjoying the gifts of the season. This time of year seems to bring an abundance of two things: partying and eating. The combination of these activities is wonderful for one’s spirits, but you always hear people complain the day after, or the week after, or the month after the holidays have passed, that they “over did it”. There are many ways to make it through the season without having to wear elastic-waist pants until the snow has melted and you can “finally get back into jogging again”. I recognize how difficult it is to have any self-discipline during this time of year. Especially after a couple glasses of wine, that blue cheese canapé doesn’t seem so wrong. To combat the deep-fried pastry appetizer problem, I find that bringing food to parties looks totally selfless even though it’s quite the opposite. It’s important to fill up on fiber and good fats so you will feel satisfied, not drunk and deprived. This delightful hummus has accompanied me to the past few holiday gatherings I have attended. It is a total cinch to make (especially if you use canned chickpeas) and everyone loves it. This recipe makes enough for you to pig out and the other guests to at least have a good sampling. Serve with crudités (pretentious word for raw vegetables) and whole grain toasts. I always like to reserve a couple chickpeas to garnish the top, with a sprinkle of paprika and a drizzle olive oil. Remember: this can be enjoyed all year round as a spread for sandwiches, or a garnish on soups or stews. I always have a jar in the fridge for snacking. Process the chickpeas and other ingredients in a food processor until well combined. It’s thicker than the hummus you buy in the store, so you can add some more lemon juice, oil or tahini if you like. Empty the contents onto serving platter or into a jar for refrigeration. Enjoy! how long can you store hummus in a masonjar in the fridge? Hi, I love your recipes, I just started to enjoy cooking with this blog. I was wondering why do you use canned chickpeas, when I saw on another post that you were talking about how it is much better (for taste and health) to use dried beans instead of canned, is in it the same for chickpeas? To Kait, to get the tahini flavor, you could add sesame oil. Only a little bit though, because it has a strong taste. My boyfriend and I just made this and it’s AWESOME! Thanks so much Sarah!!! Oh btw, if you want to make your hummus even lighter, try substituting vegetable stock for the olive oil. Hi there, I’ve been wandering around your hummus recipes, I love hummus, but I initially came looking for an almond pulp recipe. I liked your idea for almond pulp hummus but I wondered if it were possible to make something where almonds were not the main fare. 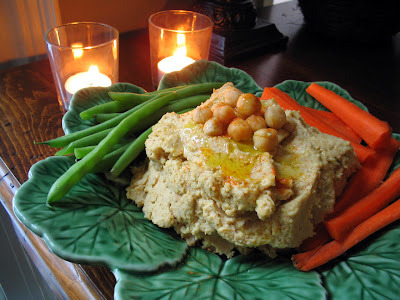 What do you think about making regular or vegetable hummus but using almond pulp instead of the tahini? What could you add to get that base flavour that tahini lends? I just checked your wonderful blog to see if you had a different twist on my hummus recipe (I made mine up) that I’ve been making for years. They are exactly the same! Good on both of us! Thank you Sara for all of your fabulous recipes! Who needs a cook book? I keep coming back to your blog! I must have recommended it to 100 people…. This is nice recipe for vegetarian and awesome for eat diet.. I’m like this one for may family..